When going abroad or visiting places out of town, my family usually stays in a hotel for couple of nights or more, depending on the length of the travel. So, visiting hotels, staying there, and touring around isn't a new thing to me. However, sharing a hotel experience is something that I am now doing for the first time. 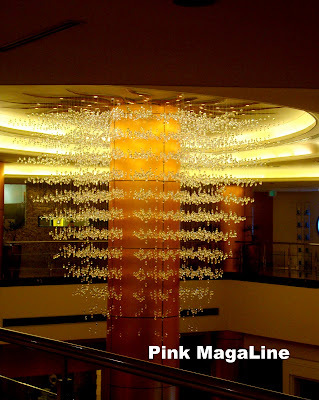 Let me tell you about.. Eastwood Richmonde Hotel in Libis, Quezon City! Upon entrance, this huge chandelier impressed me a lot. It seemed to look like rainfall. So pretty. This is one of the hotel rooms. Don't we just love staying in hotels? Huge comfortable beds, fresh sheets, and quiet sleep. Hmmmm! 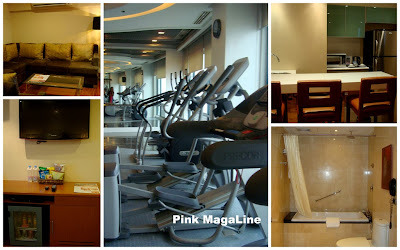 Clockwise: living area of the hotel suite, fitness gym, kitchen of the hotel suite, the bathroom, and food and entertainment section. 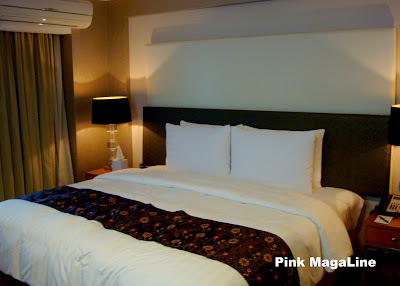 Eastwood Richmonde Hotel in Libis is a good choice for those who want to stay in the metro. They have rooms that start from $95 and up. If I have a friend visiting the country and doesn't know a place to stay, I guess I'm going to recommend Eastwood Richmonde Hotel right away. From the airport, the place is very accessible via C5 Road. Plus, it is connected to the Eastwood Mall and neighboring to lots of bars and restaurants. Imagine how convenient that is.